One of the key aspects of being a Great Project Manager, is to be a Great Communicator. 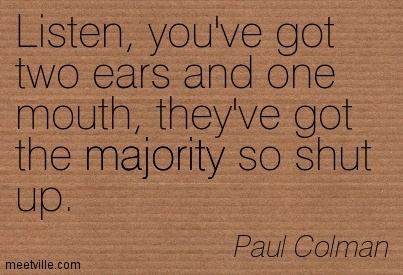 Many people think that listening is not part of communication. They think that only when they are talking is when communication happens. In most conversations, we carefully listen to the first couple of sentences, and then our brain goes into overdrive mode, thinking an apt response to the question or comment raised. It starts searching for an answer, and begins forming a response. Once this response is formed, you are now ready to speak. So you now begin to wait impatiently for the other person to “shut-up” so you can speak your planned, and “ready” response. If the other person continues to talk, you might even get impatient, and simply cut the person off, and blurt out your “planned” response. Active listening is when you actually listen to each and every sentence and word that the other person is saying. You do not begin form your response yet. Simply listen. Firstly, it immediately summarizes what the person said, and if it is not correct, or correctly understood, then the words can be corrected by them. Secondly, it shows to them that you were really listening, and creates a feeling of trust, a bond of reciprocity is formed. Thirdly, when you now speak, the other person is also obliged to let you speak completely and not to interrupt you. Further, when you repeat what they said, it helps you to make sure you got it all correct. When they feel understood, they are more willing to listen to what you have to say. Fourthly, and the Best reason for doing this is that it gives your brain much more time to form your response. Previously, the brain used to listen for only a partial message, and then form a response. Now it listens to the entire message, summarizes it, and then repeats back. This provides unparalleled clarity to you, and while repeating, your brain get more time to digest, and come up with a solid, robust answer, and not just the first thing that comes to your mind. A thoroughly thought out answer is a much better answer. Even Steven Covey, in his acclaimed book – The 7 Habits of Highly Effective People talks about this in Habit 3 – Seek First To Understand, Then To Be Understood“. 1. 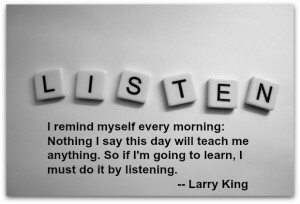 Active Listening: Before you begin any new conversation with a colleague, team member, vendor, or any other stakeholder, remind yourself to listen carefully, actively. Repeat by summarizing what was said. And then only come up with your more thought out response. See how it goes. Does it work? Did you understand their message better? Did you come up with a better, more thought out response?. Does the other person notice the change? Are you understood better? That’s a lot of things to monitor. And it may take time. Others may not even notice the change in you (that you were listening more attentively)… but do it anyway. Don’t be discouraged by their ignorance or non-response. Your communications will automatically begin to get better, and pretty soon, you will begin to see the value add. Others will too! 2. Invite a team member for lunch. Someone you don’t go out with regularly. Ask them what’s going on in their life. 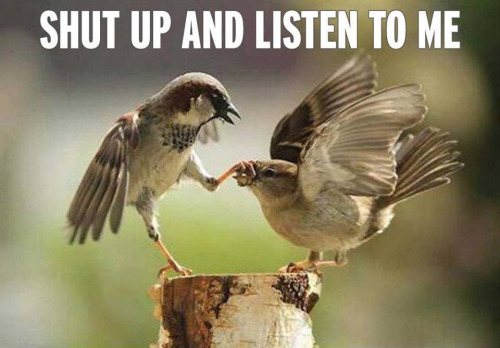 Then just shut up and listen. Nod, listen, repeat what they said by summarizing some key points. Resist the urge to talk too much about yourself, or to yawn, and don’t keep looking at your watch all the time. The problem is that we live in a world where everyone is looking for “what’s in it for me?” approach. We spend more time in Facebook, WhatsApp, glued to our iPads, Phones, and the online world, that we have lost touch with humans. When you spend the time to talk to someone, and listen actively, it will seem to open a deep well, and build such greater trust and bond, that it will improve your relationship with the team member considerably. You will feel good, and more importantly, they will feel good. And that’s the goal for today. Make someone on your project feel good. 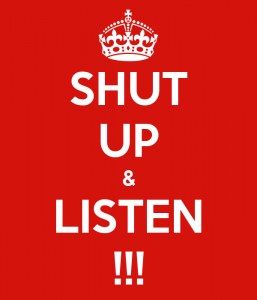 By “Shutting Up”, and Listening Actively! After the conversation, post your comments on how it went, what worked, and what didn’t. Learn . Share . Grow . Enjoy ! I am happy today by seeing your second lesson which your thought me and brothers and sisters who joined this 30 days programme. I am sure I will become a good project manager. Today’s programme will to enhance the patience to read the questions in pmp exam and in practical life to lead and maintain the projects of any size,sir.